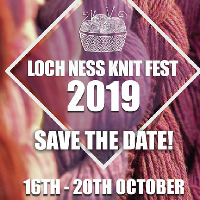 The Loch Ness Knit Fest will be returning to Inverness for it’s fourth year - save the date! Taking place on the 16th-20th of October 2019, the yarn focused festival promises to deliver legendary Highland hospitality and a jam-packed programme of Workshops, Presentations, Demonstrations, Sightseeing Tours and a Marketplace (operating over Friday 18th and Saturday 19th only). Our full programme will be announced in early January of next year, so be sure to stay tuned!